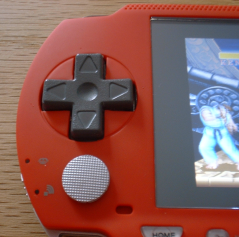 PSP with a SNES Dpad - Makes fighters playable! 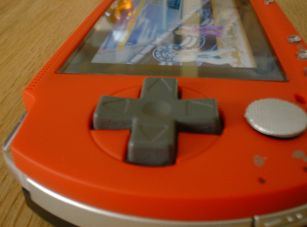 Check this out, I modded my PSP by putting a SNES D-pad in it. I used a razor blade to cut the center piece out of the case. I first tested it on my original faceplate before cutting my "Smooth as Silk" PSP face plate. I also used the razor blade to cut down the D-pad. Good thing it is rubberized plastic, which made it easy. Once it fit I curved the base of the D-pad so that the diagonals work better. I also filled in the cracks in the bottom of the D-pad with polymer clay and scotched taped over the clay. Then I tweaked the pad with layers of scotch tape on the directions to get it fine tuned. My PSP went from having the worst D-pad ever to being the probably the best ever. Maybe as good as those awesome Saturn D-pads. Anyway check out the pictures -- Shoryuken! Ever since I got my PSP there have been a few things that I have wanted to fix. First, I updated the face with a liquid platinum face plate I bought from Lik-Sang. Then I ordered Street Fighter Alpha 3 Max from Capcom and got a bonus D-pad fix. Finally, I added an Naki Analog stick replacement. Capcom's Dpad fix is pretty simple, it is justa piece of plastic that has double stick tap that you use to attach on top of the PSP's junk d-pad. Once installed there is a noticable improvement, and Darkstalkers is playable! Too bad I would have to upgrade to 2.55 frimware to play it! I will be staying with 1.5 for now. Thank you Sony!